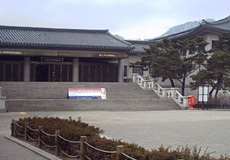 The National Museum of Korea is a sanctuary of calm and historical preservation in Seoul, one of the world's most thriving and populous cities. Located next to Gyeongbokgung Palace in the heart of this nation's capital, The National Museum of Korea is a juxtaposition of cultural heritage and national identity in a city whose ethos is hell-bent on modernization and westernization. Amidst artery-clogging traffic and tall skyscrapers topped with flashing screens and neon signs, this 59-year-old museum hosts a collection of more than 240,000 artifacts and artworks dating back thousands of years. Visitors usually begin on the second floor in the Prehistory Gallery. Here the National Museum of Korea exhibits artifacts of the Paleolithic, Neolithic, Bronze and early Iron ages, proving that humans have lived on the Korean Peninsula for at least 500,000 years. Blunt choppers and scrapers characterized the tools of the Paleolithic era, otherwise known as the Stone Age. However, by the Bronze and Iron ages, the inhabitants of this region had evolved to creating bronze and iron knives and daggers, fishhooks, currency, and jewelry, as well as ceramics. The next gallery is the Proto Three Kingdoms Gallery, comprising the time around the beginning of the Christian era when iron weaponry and agricultural tools began being mass-produced. During this period, the Korean Peninsula was divided into three kingdoms: the Goguryeo Kingdom in the north, and the Baekje and Silla kingdoms in the south. All Three Kingdoms developed highly sophisticated state organizations on the Korean Peninsula, adopting Confucian and Buddhist hierarchical structures with the king at the summit, while increasing efforts to expand their territories. State codes were also disseminated to initiate a legal system to rule the people. In the gallery, artifacts excavated from the ruins of houses and tombs are on display, as well as ceramic works of art of the era. The artifacts displayed in the Goguryeo, Baekje and Silla galleries represent the cultures in each of these kingdoms respectively. 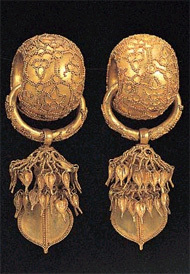 These relics are truly objet d'art, and include ornaments and accessories excavated from royal tombs, including gold and jade crowns, earrings, necklaces and belts belonging to kings and queens, as well as glass vessels from Persia and clay effigies of animals and humans. The Unified Silla Gallery displays artifacts from the 7th century, when the Silla Kingdom unified the three kingdoms, strengthened sovereign power and reorganized its central and local administrative systems. 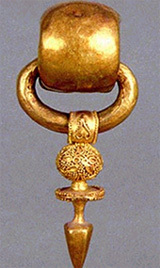 Buddhism also flourished during this time. In this gallery, the museum exhibits ceramics of the period, noted for their low heels, patterns and green paint. As well, the Unified Silla Gallery displays clay images of the 12 zodiac signs, revealing Silla's trade relations with China and the Western world. The first floor of the National Museum of Korea is mostly devoted to ceramics. The Goryeo Celadon Gallery displays beautiful celadon ware from the Goryeon period (918-1392). 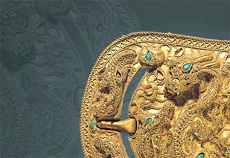 Celadon ceramic, which was brought to the Korean Peninsula from China, is most noted for its splendid jade green color. These works, which were created into a variety of items, including jars, wine pitchers, plates, cups, incense burners and flower vases, were used for ostentatious display rather than for everyday use. The gallery also features white porcelains, iron-coated chinaware and black-coated wares. 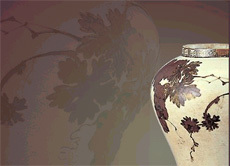 The Joseon Buncheong Ware Gallery displays ceramics from early on in the Joseon Dynasty (1392-1910). These wares were widely used among all classes, from the royal families to the common people; thus, fine high-quality vessels as well as plain and coarse wares were mass-produced. The Joseon White Porcelain Gallery also exhibits porcelains from this period, which were used by the gentry as general household vessels, utensils for sacrificial rites, decorative works, and jars. Some are pure white without any decorative pattern, while others are beautifully adorned with blue patterns of the four gracious plants: plum, chrysanthemum, orchid and bamboo, as well as majestic clouds and landscapes. The basement level of the National Museum of Korea is dominated by the Buddhist Sculptures Gallery. Devoted to two rooms beautifully lit with soft warm light, this impressive gallery displays both large and small statues of Buddha and Bodhisattva from the Three Kingdoms period to the Joseon Dynasty. Visitors may notice that many of the statues do not have hands — they were removed during the Joseon period when Yi Seong-gye, founder of the Joseon Dynasty, and subsequent kings tried to remove all influences of Buddhism from the government and adopted Confucianism as the guiding principles for state management and moral decorum. Buddhism was essentially outlawed and monks had to flee to the mountain temples, far away from state officials. It wasn't until Japan forcibly took control of the Korean Peninsula in 1910, that Buddhism experienced a renaissance and made efforts to adapt to the changes of modern society. For those who would like to visit the National Museum of Korea, plan to spend a full day there to take in each of the 18 permanent galleries, plus the several special exhibitions. The museum opens at 9 a.m. from Tuesday through Sunday (it is closed on Mondays) and beginning on March 1, it will close at 7 p.m.; the admission fee is 700 won. One-hour English language guided tours are conducted at 10 a.m., 1 p.m., and 3 p.m., Tuesday through Friday except national holidays. The museum is very easy to get to by subway — get off at Gyeongbokgung station, Line 3 (Orange), take Exit 5 and follow the signs to the National Museum of Korea. "Coming Home to Nong Khai"
"Wat Phra That Doi Suthep"
Kathryn Margaret Brimacombe is a Canadian freelance writer and photographer, who also works as an editor at The Seoul Times. Before coming to Korea, Thailand was her home for many years. Her articles have appeared in several publications, including the Pattaya Mail and Chiang Mai Mail newspapers in Thailand, and The Province newspaper in Canada. She has a bachelor's degree in anthropology from the University of British Columbia, as well as a certificate in journalism.